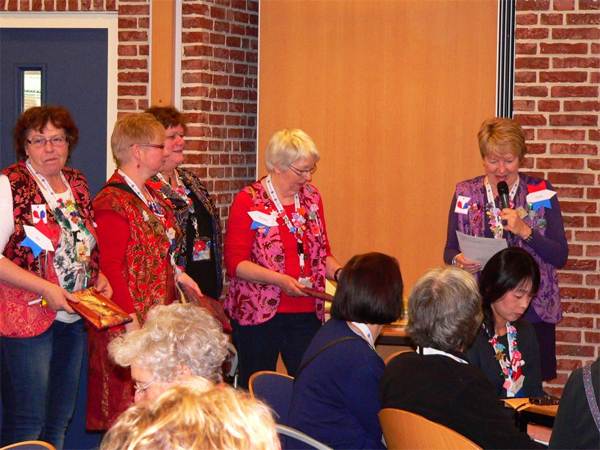 In April, I was invited to be the special guest at the 30th annual convention of the Origami Society of the Netherlands (OSN) which was held from April 12th to April 14th, 2013. It was an honor to be chosen and I had a wonderful time during my visit to the Netherlands. My trip from Tokyo to Amsterdam took thirteen hours. I travelled with my friend Satoko who also attended the convention. When we arrived at Schipohl Airport on Thursday afternoon, we were met by Pieter and Janneke Wielinga. They took us by car to the Mennorode Conference Center in Elspeet where the convention was to be held. I appreciate their kindness. The convention attendees started arriving in the middle of the afternoon, carrying heavy suitcases and wearing big smiles. 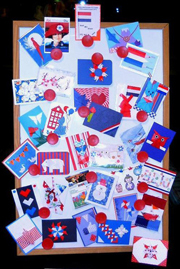 The excited crowd of folders came from all parts of the Netherlands in addition to Great Britain, Scotland, Switzerland, Germany, France, South America, Japan, and the United States. After unpacking, everyone received a large white envelope containing the schedule for the weekend, a key cord, and their room card. 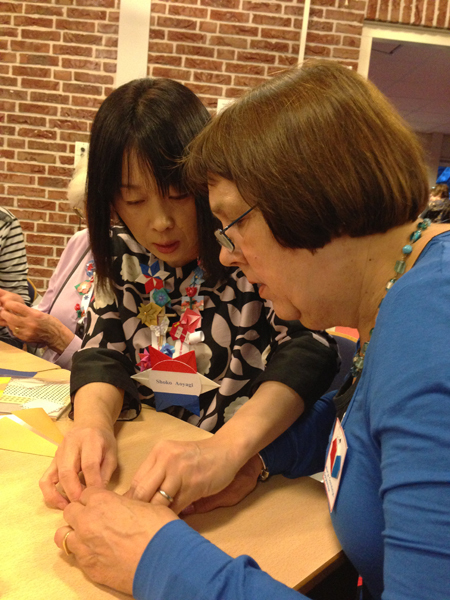 All participants were encouraged to fold and bring small origami models that they could exchange with other folders during the weekend. We attached these small origami gifts to the key cords we wore around our necks. By the end of the weekend our key cords were very full! I made 150 cute origami bears holding flower bouquets to trade. 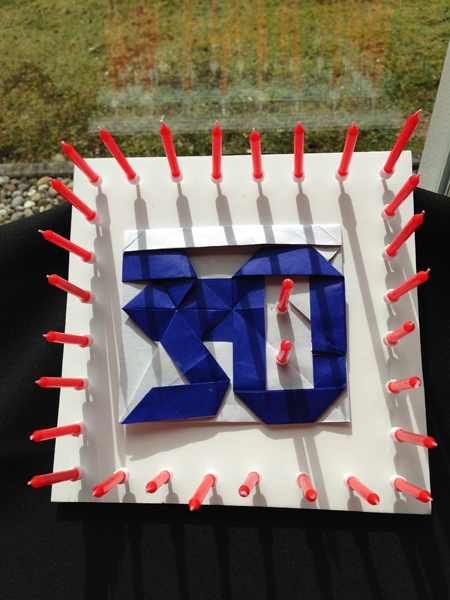 Please take a look at the photos I took that show the many beautiful origami models I received. I love them all! 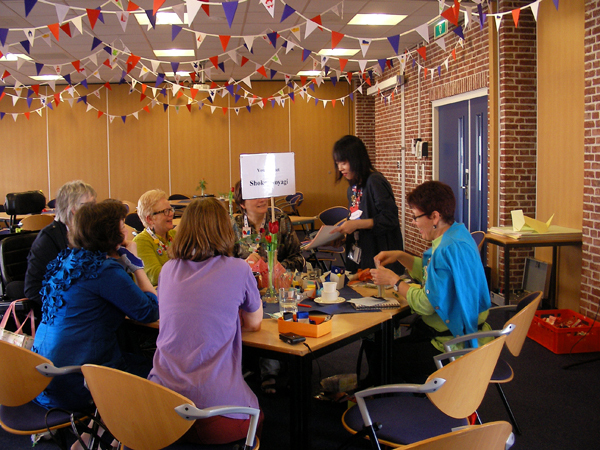 In the morning I participated in the 5th ATC Swap held at Mennorode. The theme this year was "Red, White, and Blue, Happy to fold for you." This was the first time I was asked to create an ATC. I used my original design, "Postman Snail", on my cards. Take a look at the photo that shows the selection of cards I was given. There are so many unique and creative ideas. At 11 AM, the convention officially opened. The five committee members introduced themselves and the workshop teachers. Then they welcomed the overseas guests and me. I spoke a short greeting to everyone in Dutch. Everyone smiled when they heard my greeting. 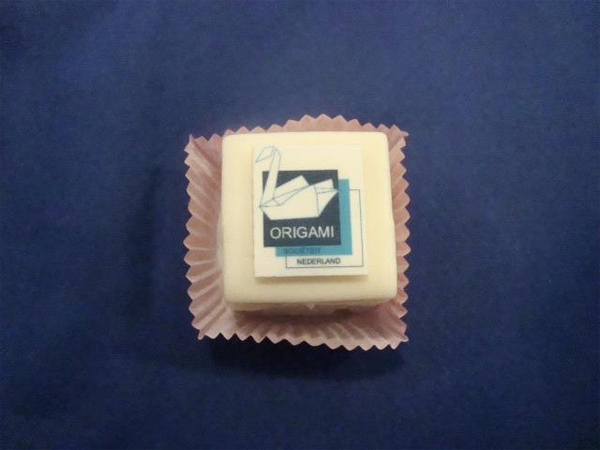 "Origami Society Netherlands Dank je wel voor de uitnodiging". After a delicious buffet luncheon consisting of soup, assorted salads, bread, cheese, and many other hot and cold foods, I returned to the large meeting room called Lucasgat D. This was where the folders gathered in between meals and the formal workshops. 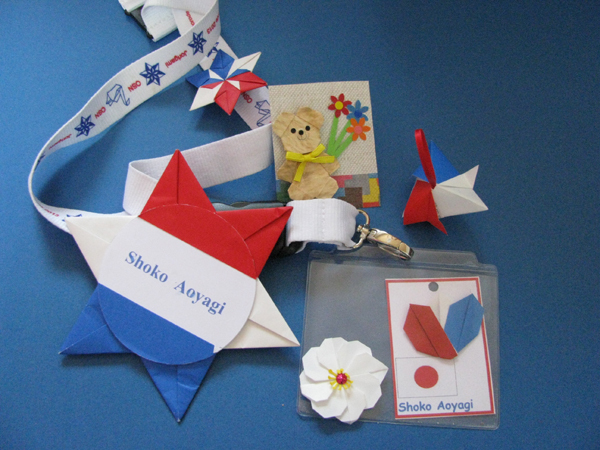 The entire room was decorated with red, white, and blue origami-decorated pennants that hung from the ceiling. It was very festive! I set up a display of the models I would teach during the weekend. Folders would stop by my table to meet me and learn how to fold some of my models. The Fairy Penguin, Postman Snail, Magic Chair, Bear, and Sitting Dog were very popular. My table was busy the entire weekend. Every seat was always full. On Sunday morning the committee members suggested I take a break from teaching to attend a formal workshop. 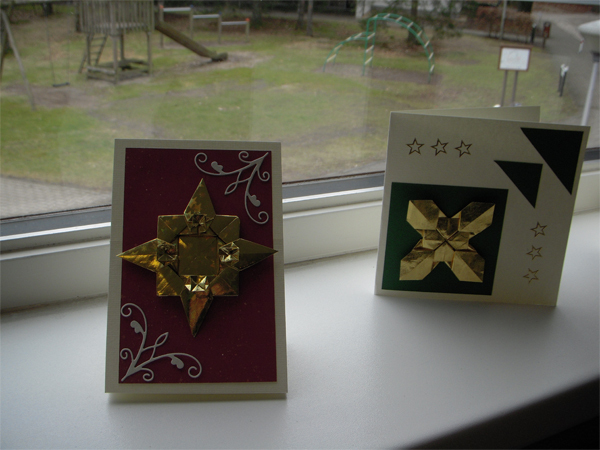 I chose the workshop, "Christmas Cards" taught by Joke Mooij. 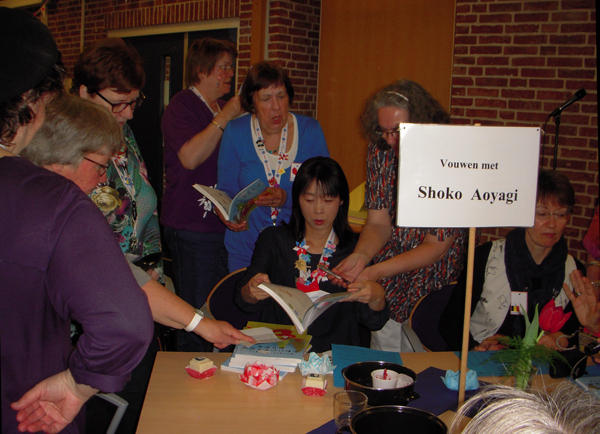 This was my first experience in an origami class that was taught in Dutch. It was fun! Joke is a good teacher. I sat next to Carla. She was very kind and helped me cut the cardboard I needed to make my cards. Joke taught us how to make three different kinds of cards. She showed us how to fold two beautiful stars. I liked the paper Joke chose for the stars! There were many wonderful workshops taught during the weekend. Luckily we were given a CD containing the diagrams for all the models taught in the workshops. The OSN Committee prepared many treats for us during the weekend. Thank you very much! 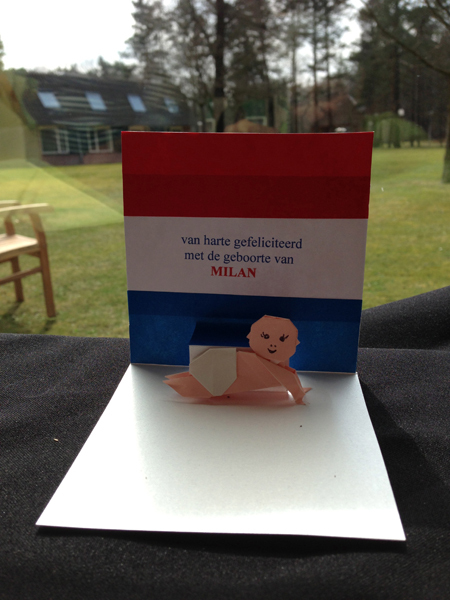 Dank u wel! 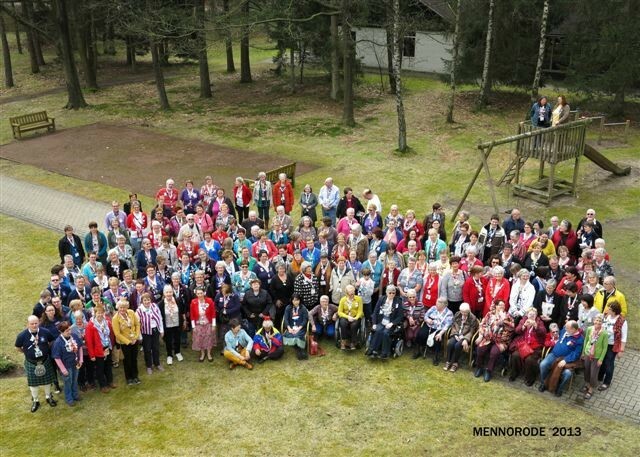 While the weather was quite cool during the convention, my heart was warmed by the wonderful folding and new friends I met at Mennorode. I look forward to returning to another convention in the Netherlands.